Going back to 1979 for today’s trip into the archives as we head to Southport for a view of Liverpool 245 whilst it was stored at the old Steamport attraction. As we all know Liverpool 245 has now been restored to operational condition and is one of the prides of the fleet at the Birkenhead Heritage Tramway, but going back to 1979 and it was a very different story. Despite having been saved for preservation 245 had not managed to find a permanent home and after having to move from the old Edge Lane Depot it made its way to the coast at Steamport in Southport where it was to be found amongst numerous other forms of transport (including the tram which can just be seen behind – more of that later!). It was stored requiring significant attention which it was unable to give it there and after a period it was moved into the Liverpool Museums large store, from where it eventually headed to the Wirral and restoration. 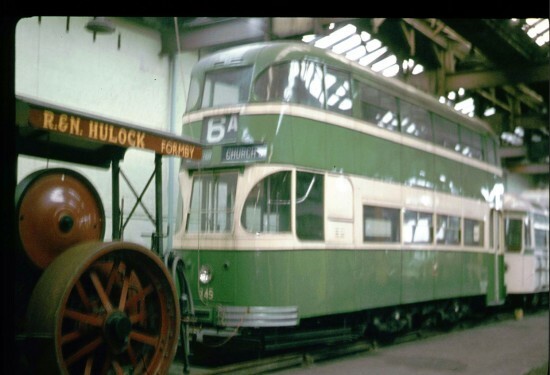 Behind the Liverpool tram can just be seen Blackpool Coronation 663 which was also on display at Steamport for a number of years. 663 itself had arrived at Southport at the start of the previous year and would remain there until 1984, after which it continued the nomadic existence it became used to following withdrawal in Blackpool. Although 663, like 245, is now in a firmer home it hasn’t been so lucky and requires a restoration before it can continue passengers once again. This entry was posted in Birkenhead Heritage Tramway, Blackpool Tramway, Picture in Time. Bookmark the permalink. Sadly 245 was parked Under the broken skylight as can be seen in the picture. This allowed water to enter the upper decks and brought the ceiling down and was the start of dry rot. It cost a lot to replace and repair the parts, but it was worth it in the end.